Can we find the spirit of ’45 in 2013? Today marks a defining moment in the history of Britain, but looking around you wouldn’t believe it. Today, April 1st 2013, sees the The Health and Social Care Act (HSCA) come into force. Some still believe that those opposed to the HSCA are over-dramatic, reactionary or naive. 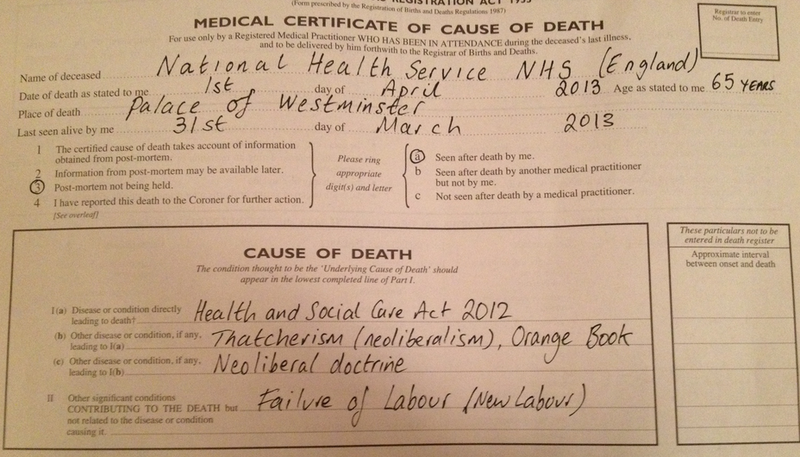 They will probably dismiss the National Health Action Party as extreme and publicity-seeking as it has issued a death certificate for the NHS, citing the cause of death as the HSCA 2013, with contributing causes including Thatcherism and the failure of New Labour. But it is difficult to see how anything but extreme statements and gestures can capture the attention of the public. Our generation is standing by as the NHS is quietly privatised and I for one am ashamed. Of course, at times it is convenient and even desirable to omit a patient’s name in a conversation. It was suggested on Twitter that it may be better to overhear what ‘bed 9’ needs rather than ‘John Doe is ready for his haemorrhoidectomy,’ and in this case I agree! My worry is that in most cases there is no explicit intent to maintain confidentiality. Instead the convenience of referring to people by their bed number slips into routine communication. I have certainly been guilty of this myself. I worry that this is not merely disrespectful, but that it contributes to the dehumanising experience of being a patient, and negatively impacts on the doctor-patient relationship. Most people I know have never watched a person die. Even those that have been to funerals and therefore have seen and been in physical proximity to a body, have rarely been present at the moment of death. 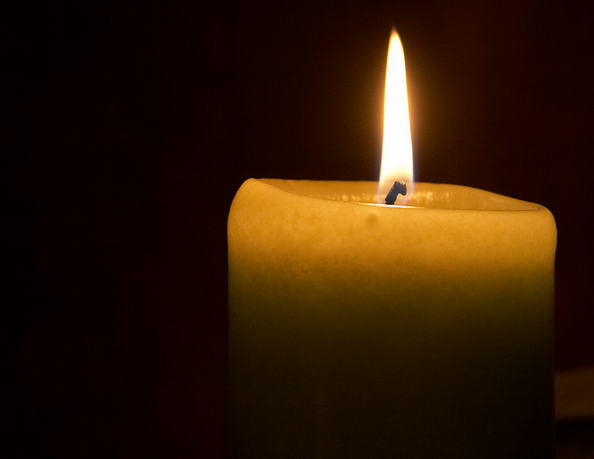 The moment when in the eyes of the dying person the lights go out. I have been there, in the moment, a number of times and remember every time with eerie clarity. Sometimes I have known the patient well; other times I have only met them in their last minutes or seconds. Sometimes it has been almost ethereally peaceful. Other times it has been frantic, chaotic or distressing despite our best efforts to treat end of life symptoms. Most often it has just happened.